The TradNation Project presents and preserves the living music and dance traditions of Québec through transmission, sharing and performance. 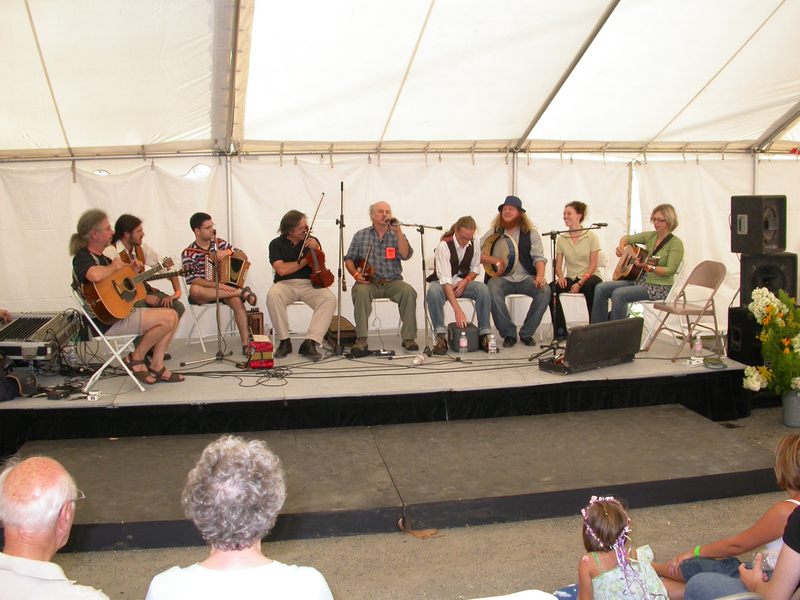 New World Festival 2013, Randolph, VT. Members of TradNation in a session. A collaboration between musicians, dancers and dance callers, the project includes multiple generations of performers from Québec’s thriving traditional music scene, presenting instrumental, song and dance traditions from the rich cultural heritage of French Québec. Among these artists are award-winning musicians and dancers, dedicated ethnologists, and composers of roots-inspired new works, all of them artists who possess and perform important repertoire from their own families, learned from local traditions – traditions that are unique to the only officially French-speaking population in North America. Through its talented and diverse performers, the TradNation Project brings the Québécois traditional music and dance experience to audiences as both a dynamic show and a participatory activity – “called” dances, presentations and jam sessions. For audiences in U.S./Canada border states, TradNation brings an exciting connection to a shared historic and cultural past, since as much as 30% of the population of these states boast French-Canadian roots. While Franco-Americans have lost a part of their musical heritage over time and distance from their native home and language, the repertoire and authentic sound of TradNation’s musicians brings audiences songs, music and dance that have been preserved in Québec and also offer an opportunity to “connect the dots” with our U.S. cousins, comparing notes and hopefully filling in some of the gaps in our respective knowledge of Québécois roots music and dance. The TradNation Project consists of a musical and dance concerts, presentations, called dances and showcases in a variety of markets that include New England, US/Canada border states, and Southern and Western regions. In addition, the project is represented at prominent music conferences including : North American Folk Music & Dance Alliance (Missouri), NERFA (New England regional Folk Alliance conference, New York), SxSW (Texas) and other gatherings pertinent to roots music. The project offers US presenters the option to present a large show or smaller performances in accordance with their budgets. In addition to performances, TradNation has a partnership with the Young Tradition Vermont organization (Burlington) to share repertoire and offer young Vermont artists interested in Québécois traditional music a chance to participate in both Québec and US showcases. The TradNation Project has a strong commitment to transmitting, sharing and conserving Québécois music and dance traditions.